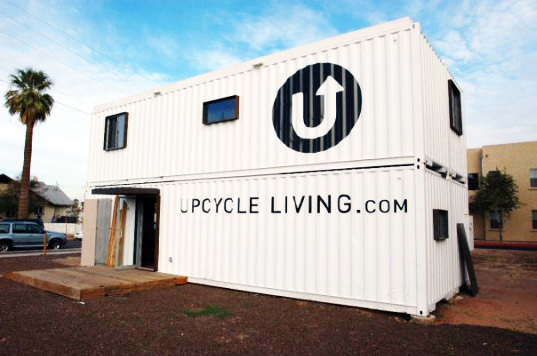 Phoenix-based Upcycle Living is aiming to bring affordable shipping container housing to the masses with its modern cost-effective designs. Just las fall they installed a 2-bedroom house at a green street fair in Phoenix, and orders started rolling in. The designers and builders now expect that they can produce a similar modular model for less than $100,000. The 2 bedroom, 2 1/2 bathroom model installed at the street fair measured 1,280 square feet and was built out of four 40-foot shipping containers. For the street fair the corrugated exterior was left as-is, so onlookers would be able to recognize it for what it was. Future models will be solar panel ready and include a shade screen to help the homes remain cool in the hot desert sun. Inside, the home features recycled hardware floors, bamboo cabinets and new Energy Star appliances. As the pictures show, it’s definitely roomey inside and plenty big enough for a small family. 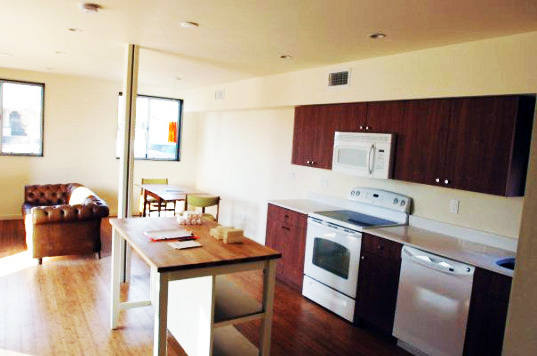 Upcycle Living claims to be able to provide housing for at least 2/3 less than traditional stick-built homes. There are already orders for private homes, but Upcycle Living hopes to work towards building affordable housing on a larger scale and they are currently working on a development to provide housing for a Native American Tribe. Since the Haiti Earthquake they have also reached out to NGOs in hopes of helping provide temporary shelters, permanent residences, or even medical clinics. It’s refreshing to see a company out there building and proving that housing costs don’t have to be exorbitant. I think it's a great idea. I have read about a few other groups doing it and it seems like there are lots of shipping containers just rusting away. The thing that concerns me at first glance is fire suppression. Unlike a wood framed home, the interior components of this metal box could burn very quickly and turn it into an oven in minutes. What is being done to protect the occupants from a fire? Is there some kind of suppression system? It doesn't seem like it would be all that difficult to include one. But, just seems like something is most definitely needed. WOW.... I often pass this home coming from the Gym and I finally got a chance to go in side I met Jason Anderson whom at the time was being interviewed by a group out of London intrested in the structure. They loved it. I was taken aback by the contemporary style and simplicity of the interior and exterior of the structure. This is a great idea. Container homes are a great idea and I don't understand the negative opinions of ISBU homes some have. I've been working on some container home ideas of my own at http://putterordiemyblog.wordpress.com/ I am keenly interested in affordable, green home ideas. If green designs are made more affordable than more green homes will be built. This is just a hobby for me - I am not trying to sell anything here. I have seen simillar schemes before and love the idea very much. Being in the construction industry in Asia and Middle East, such 'housing' is being used to house workers on remote sites. Would be very interesting to adopt and adapt it for families in developing countries. Totally prefab operation in terms of production with ease of delivery to any developing countries by shipping and road. Concern on mechcanical, electrical and plumbing matters can be resolved and add avantage of a flexible facade treatement is a plus. Seriously wonder what a 4 container, fittted out module will cost ... that I believe is the next hurdle to address financial feasibility of a mid scale development. Well Done! i like this trend and want to live in one for cheap! trailer for a house... garbage for a design. who wants to live in a house that looks like a shipping container. you're trying to solve the problem, when YOU are actually the problem. Great model for third world countries though...Could really help with a Haiti type of situation. Wow what a brilliant idea! A metal rectangular box that is cheap to live in. We could build whole parks full of these for people to live in. SO innovative, perhaps we could build some second rate schools nearby and really follow the trailer park model. Because of the name, I'm wondering whether all the rest of the house (interior + MEP) were also made with the same 'upcycling' method? Thank you in advance for the info.